“Climb every mountain…” Universal Pictures’ Everest is a breathtaking docudrama/biographical picture of a mid 90s all but completely failed expedition to the top of the world, frocked with tragedy. For those of us who have never been to Mount Everest, which is most people, this movie takes you up close and personal with the “most dangerous place on earth.” Never before has a movie taken the audience to place where you are viscerally confronted with the famed mountain in the Himalayas that dares even the most intrepid of climbers to scale. Although the movie has a fantastic cast and the panoramic views of Everest are breathtaking, Everest plays off more as a glorified documentary than a work of cinema. Not saying it isn’t impressive–certainly the movie has some very impressive elements–but, it lacks the cinematic structure of a traditional movie plot/subplot, theming, and subtext. It pretty much is what it is: a reenactment of an actual event on the treacherous slopes of the rooftop of the world. Shot mostly in the French Alps, with pickup shots and IMAX footage of Everest herself, the footage is beautiful and inspirational. If you dare to ascend the forbidden mountain, be sure to do it in IMAX! Everest is about the 1996 Everest expedition of Adventure Consultants, a New Zealand-based company ran by Rob Hall (Jason Clarke) and Hellen Wilton (Emily Watson). Facing dire financial times, Rob and Hellen need this expedition to be a successful climb to the top of the world. Attaching a journalist from an outdoor adventure magazine, Rob and Hellen will pull out all the stops to land the front cover. Once the expedition team safely arrives at basecamp, it becomes apparent that a storm looms on the horizon. Rob teams up with rival expedition leader Scott Fischer (Jake Gyllenhaal) in order to lead both teams to the summit safely and back to camp before the severe storm collides with the mountain. As the best laid plans of mice and men often meet with disaster, so does this ascension. In regards to the plot, there isn’t much to tell. 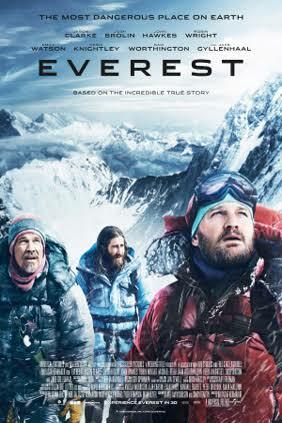 The movie is about an expedition to the summit of Everest, and that is what you get. The writers try to include some subplots, but they really add little more than establishing where people are coming from and if they have a family. When the movie opened, I thought that the cinematography was amazing! The mountains were so real that I felt the chill of the air and the choice of angles showcased Everest and the Himalayas quite well. However, it was midway through the film that I realized that the cinematography wasn’t anything extra special. Certainly, it was above average and the IMAX footage was brilliant to behold; but, it was above average–nothing in particular to note. That being said, the camera was handled with care and the shots were carefully crafted. I think what gave the illusion of breathtaking cinematography was the fact that the mountains were displayed majestically on the giant screen. The majesty of the mountains enhanced the cinematography. So, it was the beauty of the mountains, not the cinematography in and of itself, that was outstanding. I really feel this movie is meant to be viewed in IMAX because of the grandeur of it all. Watching it in a standard theatre or at home will not do the film justice. When a film’s foundation is built upon the visual stimulation, and not the psychological or emotional aspects that are common of films, then a movie needs to be screened in the best possible auditorium or IMAX theatre. This is a larger than life story, and should be seen on larger than life screens. Despite the lack of a traditional plot, I appreciated the film’s dedication to focussing on the expedition itself and not getting wrapped up in a love story or an underdog’s triumph. If you enjoy epic adventures, bio pics on Nat Geo, or just want to visit Mount Everest, then check out Universal Pictures’ Everest opening in mid-September across the country. Word to the wise, don’t eat a massive lunch or dinner prior to seeing this film.